Since Metazoica isn’t really a cat fan, I thought that this would be about the only time this blog ever really talks about the possibilities of cats surviving into the future. 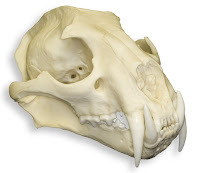 Cats are a rather specialized bunch of carnivores, lacking hindmost molars and being almost completely restricted to carnivory, but hey, that hasn’t stopped a group from being successful. Look at snakes, all of them are obligate carnivores, and they’re one of the most successful groups on the planet. So, in this post we are going to pick out some of the more outstanding members of the cat family, and speculate on their future. Please note that cats like the cheetah or the lion are not included here, as they are rather endangered and their future does not look too bright. Of all the pantherines, or big cats, the jaguar looks to be the only one to have a really good chance of surviving into the future. Jaguars are spread across a wide swath of land, ranging from Mexico to Argentina. This greatly helps their chance for survival. There is also indications that jaguars are moving their range back north again, to their old haunts of Texas and the American Southwest. If they can get there, then their survival is essentially assured. Americans have always been rather good about their conservation, especially that of large mammals. But there is another reason why the jaguar is interesting, apart from its range. In the Pleistocene the jaguar and the cougar competed with each other for food and resources. To minimize competition the two specialized slightly for different habitats, the cougar becoming more of a mountain-dwelling animal and the jaguar becoming better adapted for the rivers, lakes, and waterways. The jaguar then began to adapt to the prey of its new home, specifically turtles. Jaguars are unusual among cats in that they have a massive crushing bite force, which is usually used to kill turtles but is enough to smash a glyptodont’s skull wide open. In the future, jaguars could take their jaws to new heights, becoming the cat equivalent of tyrannosaurs or hyenas. Despite the name, jaguarundis are not related to jaguars at all, they are actually closer relatives to the cougar or cheetah. Together, these three cats form a group to the exclusion of the other cats, though this clade has yet to be given a name. Jaguarundis are found in Central and South America, but also in the deserts of Texas and the southwest (the southwest is also home to cougars, ocelots, and bobcats in addition to the jaguarundi, how weird). The jaguarundi does not look very much like its cousins the cougar or the cheetah, or like any other cat for that matter. In fact, the jaguarundi looks a heck of a lot like the fisher, an arboreal mustelid carnivore found further north in the U.S. In addition, the skull of a jaguarundi looks a lot like that of an otter, another strange coincidence. 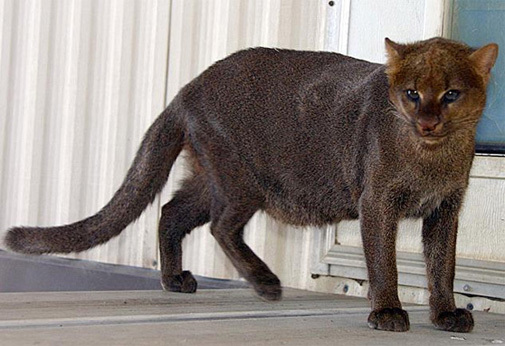 In the future, jaguarundis could evolve into effective desert carnivores, their lanky bodies allowing them to dart through canyons and thorny brush. The cougar could almost be considered sort of a Cinderella story amongst cats. Despite being as big as a leopard or a jaguar, cougars are not related to them at all. Rather, cougars are “small cats” in the family Felinae, along with your domestic house cat. The proof of this is in the pudding, or in this case the cougar’s voicebox. Cougars cannot roar, like lions or tigers, but can purr, like the housecat. Cougars were once hunted relentlessly, like wolves and bears, on the basis that they were detrimental to livestock. I can see what they meant, as I have heard stories of cougars taking down fully grown bison (as in the bison later died of blood loss, not the cougar actually felling the beast). Cougars have also held on better than wolves have, and are actually making their way back east. Cougars have already been seen on a spotty basis in the Eastern U.S., perhaps one day they will range over all of North America, or radiate out to take the place of the possibly extinct big cats. If there is any cat likely to replace the cheetah, it is the serval. These lanky felines, native to sub-saharan Africa, have the long legs of any cat. Although they prefer rodents, servals are also known to attack rabbits, hyraxes, and even smaller antelope. Servals also have large ears and a long neck, to see and hear prey in the long grass. All these adaptations make servals one of the most efficient cats, catching their prey 50% of the time. In the future, servals could take their lankiness and senses to the extremes, replacing the likely-to-be-extinct cheetah. It could use its long legs and excellent senses to track down antelope, and then race after them at amazing speeds. Servals are also excellent leapers, and oftentimes hop or pounce on their prey, which could serve a hypothetical cheetah-like serval well. Despite their appearance, caracals are not related to lynxes. In fact, their fake lynx act is so good that it had biologists fooled for a time, until genetic studies came out. As it turns out, the caracal is actually related to the serval, not the lynxes. Also unlike the true lynxes, the caracal is native to the dry steppes and desert, but will occasionally go into woodland areas. Caracals have excellent hearing, but their main claim to fame is the fact that they are excellent bird-catchers. Being excellent leapers and jumpers, caracals are agile enough to catch a bird in mid-flight. However, the caracal is also adept at catching rodents, hyraxes, rabbits, and even small antelope, gazelles, and ostriches. Millions of years ago, great saber-toothed cats roamed across the world (and a few marsupial knock-offs to boot). These animals ranged from the macharodontine cats to the closer to home (as in subfamily Felinae) dinofelids. But, there are no real saber-toothed cats today, they are all gone. However, there is a possibly replacement waiting in our midst. Meet the clouded leopard. Among the cats, it has the largest canines of all, a whopping two inches long! These cats are excellent arboreal hunters, taking on deer and such on the ground, and attacking gibbons and monkeys in trees. If these cats survive, they could develop their canines into more effective killing tools, and saber-toothed cats could once again walk the Earth. The fishing cat is a rather odd and unique species of cat from Southeast Asia. It swims very well, even better than its close cousin the Leopard Cat, which is very good at swimming itself. The Fishing Cat, as its name suggests, feeds mainly on fish and other aquatic animals. Its digits are webbed, allowing it to swim and gain traction on muddy ground rather well. In the future, the Fishing Cat could capitalize on these adaptations, and become more adapted for life in the water. It could become fully aquatic, the cat equivalent of a river otter. Unfortunately, this cat is currently endangered, and its survival into the future does not seem assured. So why, why on Earth is the domestic cat in here, amongst all these other fascinating members of the feline family? Well, domestic cats are some of the most adaptable of all carnivorans. By hitching a ride with humanity, these cats are now found on six of the seven continents, and have succeeded in surviving without human help in all of them. 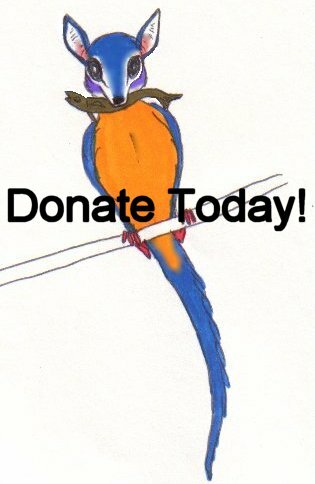 Feral cats are so good at what they do, in fact, that they can sometimes seriously affect the populations of local songbirds. Of all the cats, this cat is the most likely (and very likely at that) to survive into the future. Okay, so that's it for the evolutionary future for cats. Next week, its big, bad birds. I like the jaguarondi. it looks cool for some odd reason. That is because it is (in purely scientific terms) "unnecessarily badass". I may have to steal some of these ideas for TFIB, Metalraptor. Though, I guess it wouldn't be stealing, would it? Not really. I already suggested the jaguarundi idea to you. As for the jaguar, I already used the jaguar as the ancestor for my notomachairodontines, or "crusher cats". But the rest are all open and available.